Canada’s Vancouver Island is the ideal place for a road trip. There are opportunities to explore huge lakes, lush rainforest, jagged mountain peaks and pristine sandy beaches that stretch for days. Contrary to many first-time visitors expectations, however, Vancouver Island is a pretty big place. 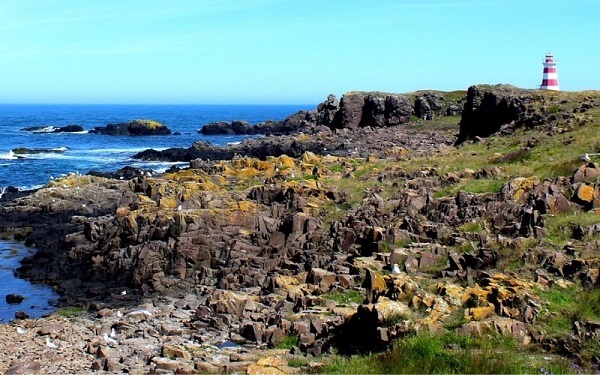 At a length of 460km, it is actually twice the size of Prince Edward Island (which is a whole province!) on Canada’s East Coast. Vancouver Island also has five times the population of PEI. Despite the size, most visitors to Vancouver Island only see Victoria and the coastal town of Tofino. I can understand why, if short on time. The coastal scenery around Tofino is simply stunning and British Columbia’s capital city has plenty of attractions in its own right. The main purpose of this post is to show that Vancouver Island offers more than just Victoria and Tofino. Vancouver Island has so much potential for other amazing adventures and trips but so few visitors get to experience it. 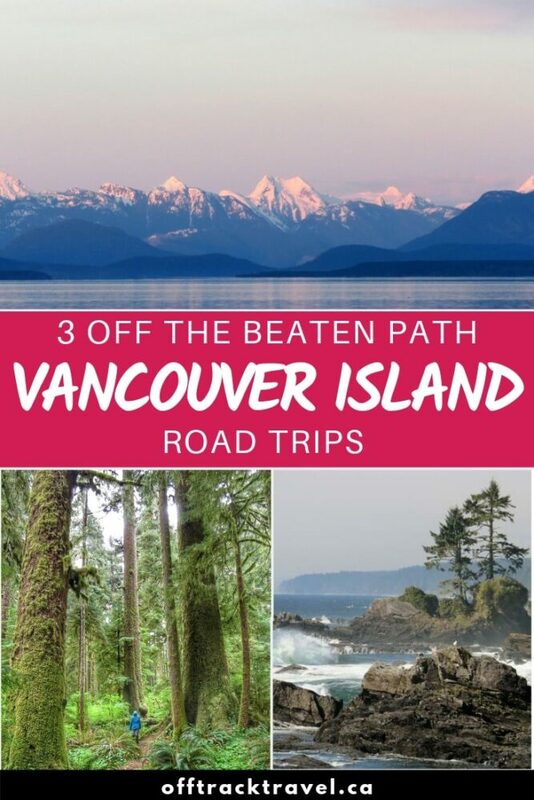 Here are my top three alternative Vancouver Island road trip itineraries for those who want to explore beyond the beaten path. I used to live on Vancouver Island (for 2.5 years) and have explored the length and breadth of this beautiful place. It’s one of my favourite destinations in the world! This post includes some affiliate links. If you click on these links and then purchase an item, I receive a small percentage of the sale. I only recommend items I have personally used or would use. his highway connects the majority of Vancouver Island’s larger communities, such as Duncan, Nanaimo, Courtenay and Campbell River. The other major roads include a short spur from Victoria to Swartz Bay (Highway 17) and a smaller southern coastal road to Sooke and Port Renfrew (Highway 14). Another major route is Highway 4, cutting through the centre of the island from Parksville to Tofino via Port Alberni. What Vancouver Island may lack in major roads, it more than makes up for in backroads. 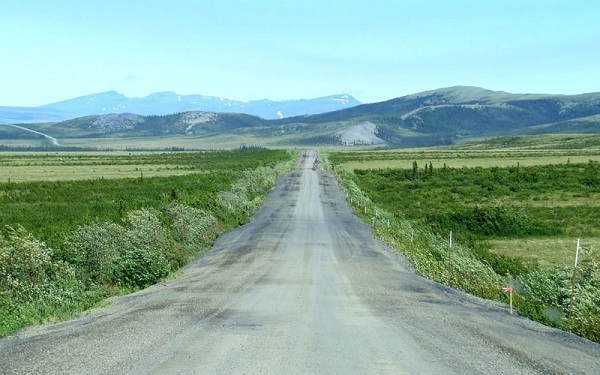 Snaking out from behind the coastal communities into the wilderness are thousands of kilometres of dirt and gravel roads. These are the real key to exploring beyond Vancouver Island’s beaten path and consequently, one of the below itineraries heavily features them. 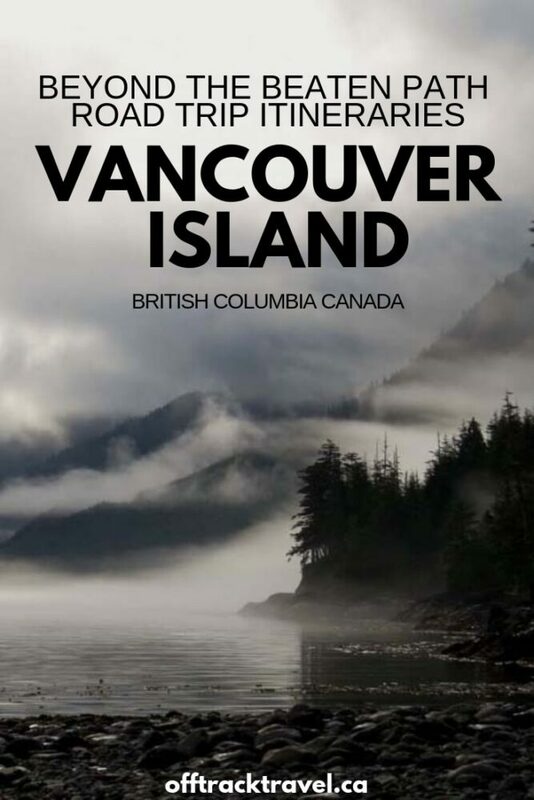 To navigate, you’ll need a Vancouver Island Backroad Mapbook. It’s an investment well worth making. Starting and ending in Victoria, the Pacific Marine Circle Route is ideal for travellers who want to see Vancouver Island’s stunning coastal scenery and lush rainforest. This road trip offers a similar blend in experiences to that of the classic Victoria and Tofino combination, but with far fewer kilometres. It’s a less touristed route too. Leaving from Victoria early, head west out of the city. Get your first real taste of the Pacific Coast at East Sooke Regional Park. Follow the short trail to the pocket beach or take up the challenge to hike to impressive Creyke Point. Consider a short detour Sooke Potholes and discover beautiful, polished rock pools. Back on the coast, watch the waves break in at Sheringham Point Lighthouse. From here, the road starts to get quiet and the scenery even more beautiful. 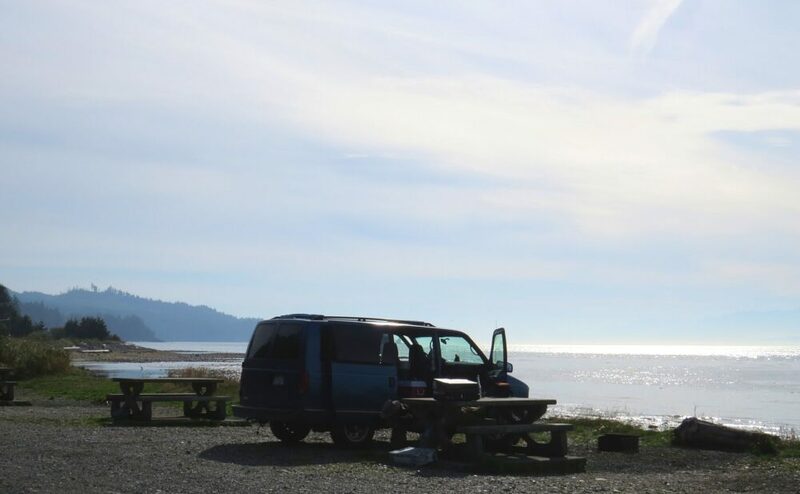 The Juan de Fuca coast is a local’s version of Tofino’s Pacific coastal experience, offering beach-combing, ocean-side camping and dramatic coastline. Visit one beach, visit them all – my favourites along here are Mystic and Sombrio. Tucked away slightly inland at the end of the drive is tiny (and slightly sleepy) Port Renfrew. If you don’t have your own accommodation, Port Renfrew is a great place to stay a night or two. Campers can choose between Jordan River Regional Park (epic views! ), China Beach campground or beach campsites. Looking to book a stay in Port Renfrew? Before leaving town, be sure to explore the rich tide pools and fascinating geological features of Botanical Beach. It’s now time to go inland and marvel at Vancouver Island’s magical old growth forests. 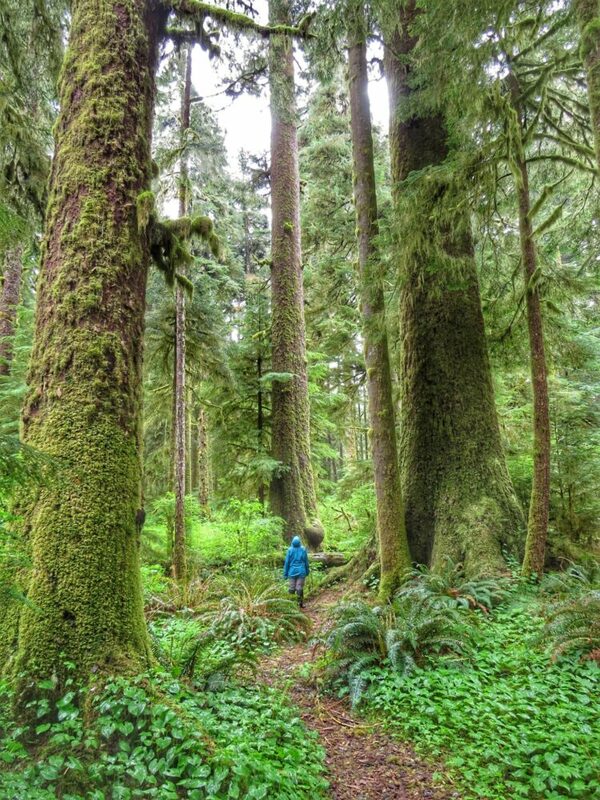 Not far from Port Renfrew is Avatar Grove, a protected area featuring many ancient trees. Take note – the last couple of kilometres to Avatar Grove are gravel. Be sure to wear some sturdy hikers as you explore the rainforest. Continue on from Avatar Grove to Cowichan Lake, a popular summer retreat for residents of Victoria. Stretch your legs next to Skutz Falls in Cowichan River Provincial Park. From the small town of Lake Cowichan, it is almost a straight shot back to Victoria. But why rush? Consider a stay in this area or nearby Mill Bay. 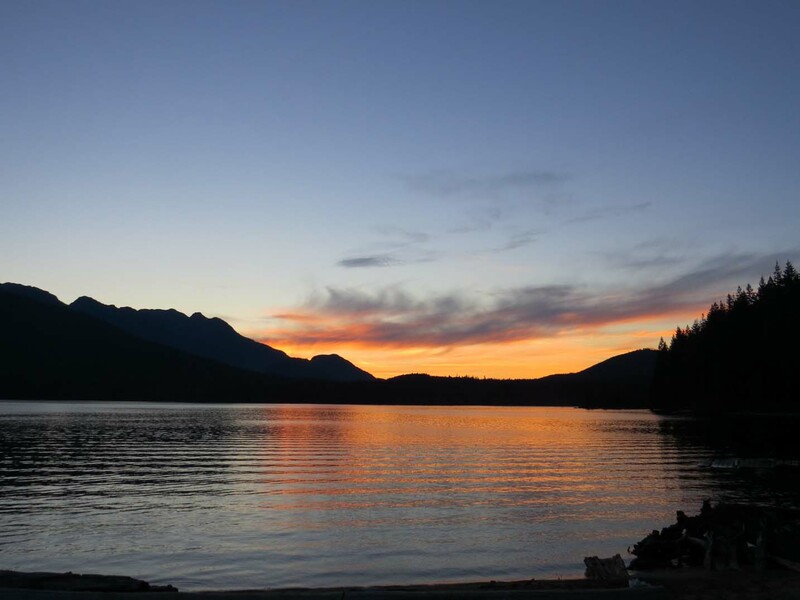 Campers will find plenty of Recreational Sites around Cowichan Lake. 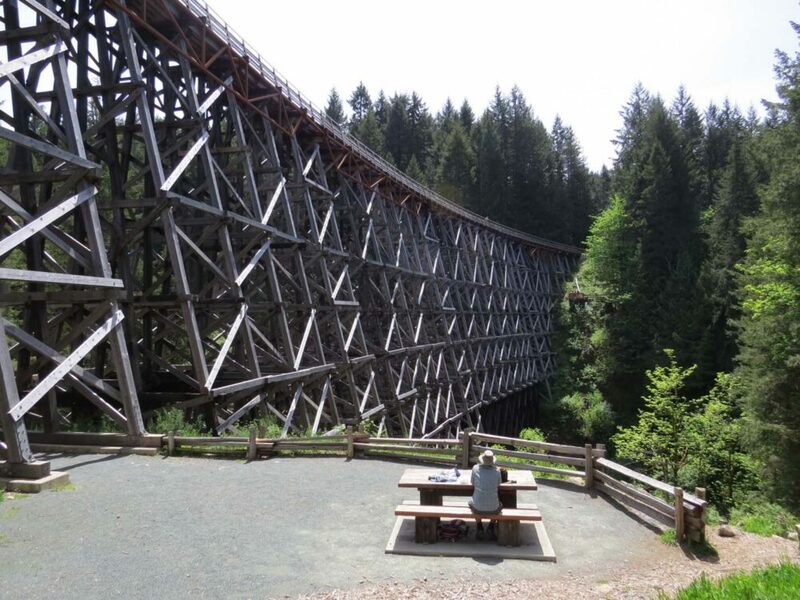 Heading down island, a must see is the impressive Kinsol Trestle near Shawnigan Lake. This bridge is one of the largest wooden railway crossings in the world. The Kinsol Trestle easily accessible via the flat Trans Canada Trail, a 2.4km round trip from the parking lot. Take time to follow some of the winding roads to the east of Shawnigan Lake – you’ll find small farm shops, wineries and even a distillery. An ideal next stop is Goldstream Provincial Park, where you can awe at more huge trees, waterfalls, salmon (in season) and the panoramic views from Mt. Finlayson (4km return). Campers can stay at the large campground here (reservations recommended). For everyone else, the city of Victoria is just twenty minutes drive south. To top off your Vancouver Island experience, don’t miss a chance to see orca whales on a Zodiac boat tour. Looking to book a stay in Victoria? 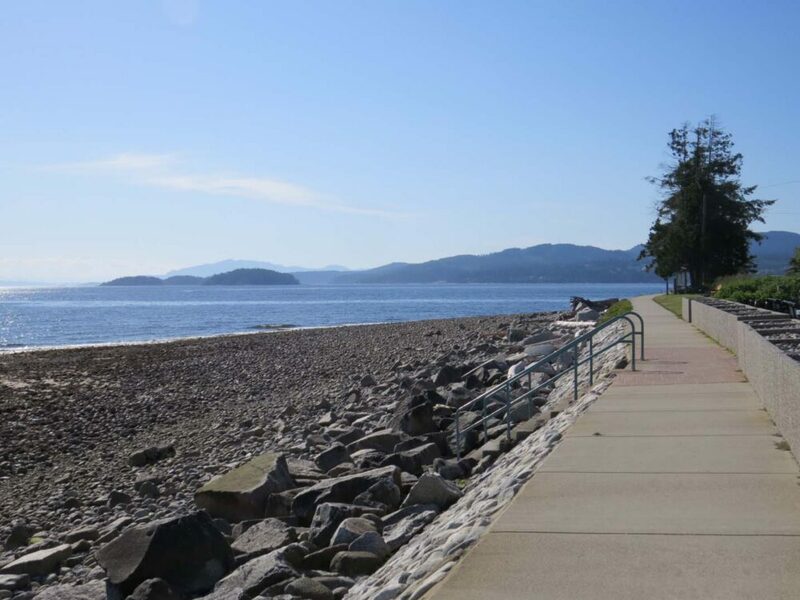 Stay coastal with this route on mid-Vancouver Island and the Sunshine Coast. OK, a cheated a little and extended this road trip to a non-Vancouver Island location. But trust me, the extra ferries make this adventure more than worthwhile. Starting and ending in Vancouver, this route can blend perfectly with a longer road trip around British Columbia. Start your journey at the Horseshoe Bay ferry terminal in West Vancouver. Arriving at Departure Bay a couple of hours later, make your first stop at Newcastle Island. 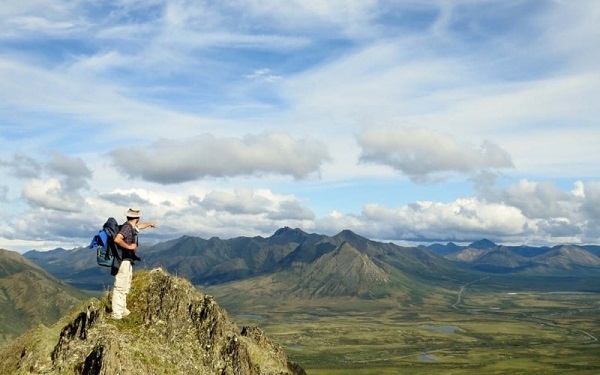 This is a beautiful Provincial Park where only boats, bikes and hiking boots are allowed. 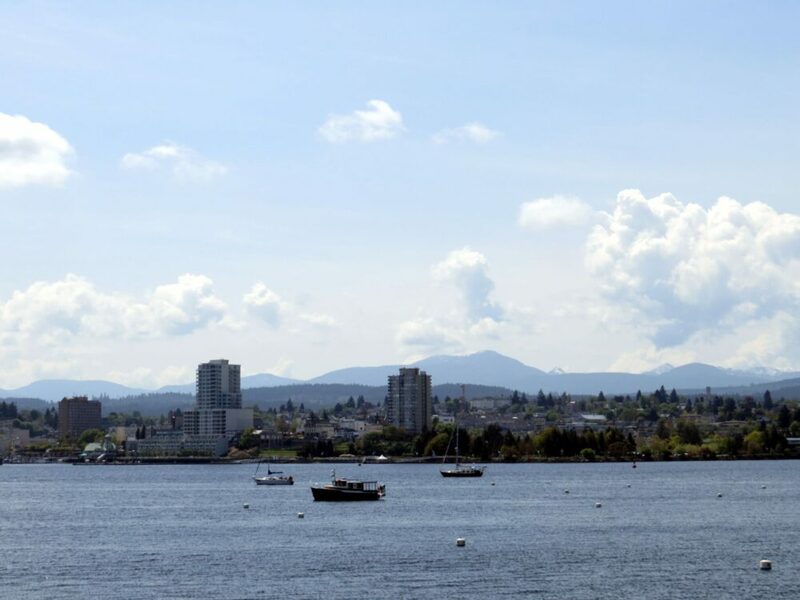 In the evening, take a walk along Nanaimo’s waterfront and enjoy a beer or two with a view. Looking to book a stay in Nanaimo? Head north on Highway 19, stopping at dramatic Englishman River Falls. Closer to the coast, have a stroll on one of the sandy beaches in the Parksville area. Qualicum Beach’s promenade is also a great alternative. On a clear day, you can see the seemingly endless coastal mountains across the water, a fantastic backdrop from any angle. 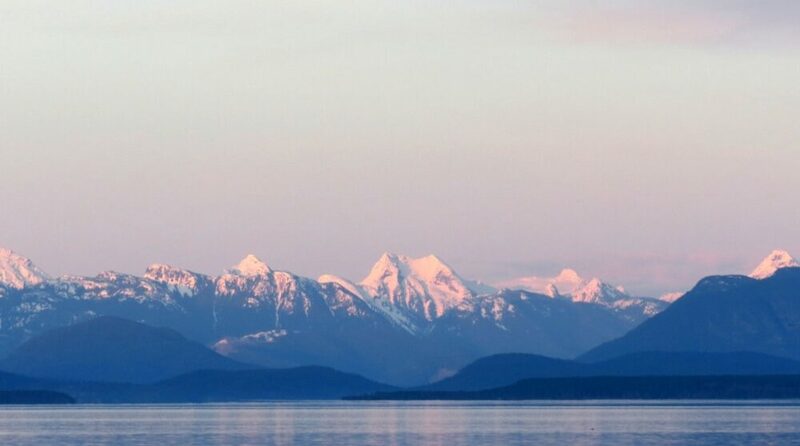 In the Comox Valley you’ll find more spectacular ocean and mountain views. Kayak, golf, hike, swim, fish….you can do a bit of everything here, including skiing and snowboarding in the winter. 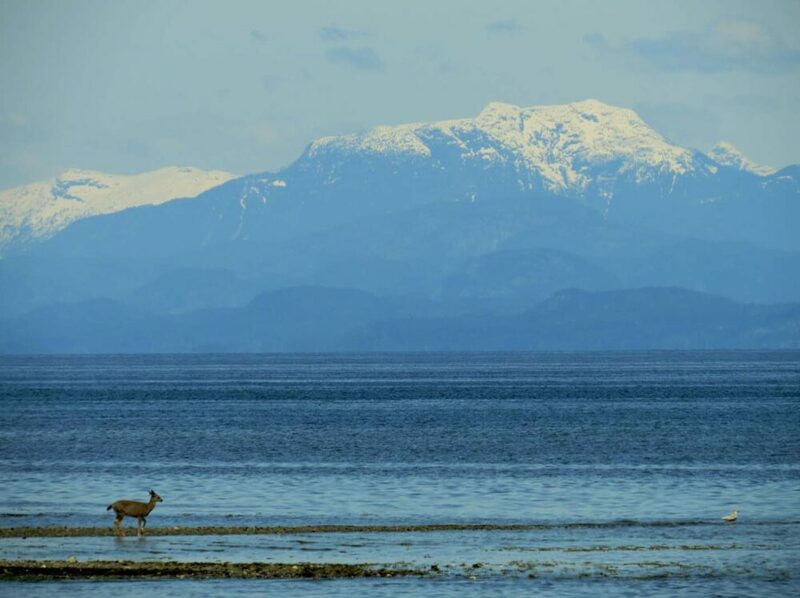 Take a trip out to Goose Spit for views of both Vancouver Island and mainland mountains behind the ocean. For cooler temperatures and alpine flowers, make the easy drive up to Mount Washington and explore the Paradise Meadows area. There is a beautiful boardwalk trail, ideal for all abilities of hiker. If waterfalls and whale watching take your fancy, don’t miss driving further up Highway 19 to Campbell River. The beautiful coastal views on the slower Highway 19A is well worth the trip alone. Campbell River is the gateway to northern Vancouver Island. Here, things start to get a bit wilder. It’s also a lot less quiet than the southern end of the island. Book in for an afternoon whale and bear watching tour before heading out of town for a trip to Elk Falls. This magnificent waterfall is viewed from a suspension bridge. Prepare to have your breath taken away! Return to the Comox Valley to take the ferry over to Powell River on the British Columbia mainland. Perched where the mainland mountains and the waters of the Georgia Strait meet, Powell River is a little gem of a town. Once reliant on heavy industry, Powell River is a haven for creatives and those who love the water. If you want to go paddling, this area is paradise, with Desolation Sound to the north, Savary Island to the west and the Powell Forest Canoe Circuit to the south-east. Kayak rentals and tours are available to rent in Lund, a cute harbour village at the end of the highway. Hikers are catered for too, with the 180km long Sunshine Coast Trail starting in Lund and passing very close to Powell River. Go on a day-hike or stay overnight in one of the trail huts. There are two more ferries to take on the way back to Vancouver, but whatever you do, be sure not to rush. The highway winds its ways along the coves and bays of the pretty coastline, offering wonderful views everywhere you look. Be prepared to stop often and drive slowly. Those wanting to extend their trip should consider an overnight stay in Sechelt or Gibsons. A must stop is the Skookumchuck Narrows, a whitewater wonder of the world. 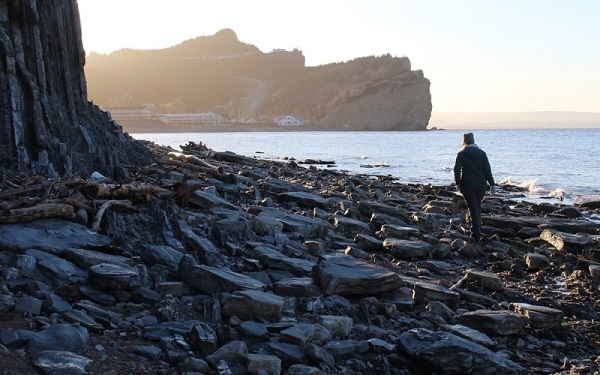 An easy and mostly flat 8km return hike leads to a viewing area where, twice a day, you can watch as the saltwater flow changes direction and creates huge waves and whirlpools. Be sure to time it right during your own visit! 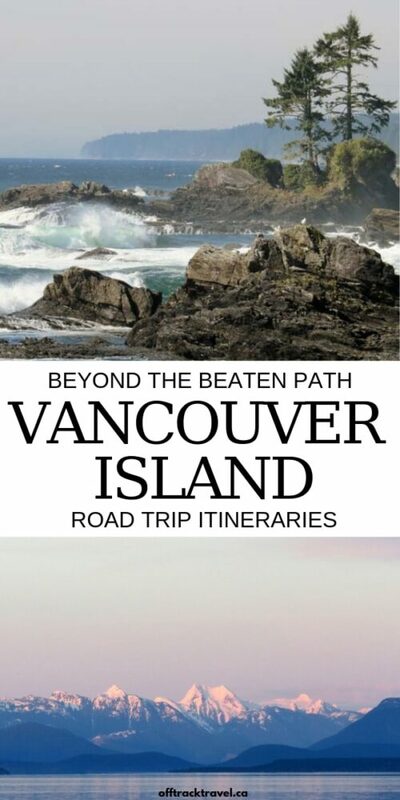 Looking for a Vancouver Island road trip that is truly off the beaten track? This is the one. Northern Vancouver Island is almost a different world to the southern parts with huge mountain ranges, rugged rainforest and very few communities. In consideration of the latter, it is preferable to bring your own accommodation in the form of a tent or campervan for this road trip. 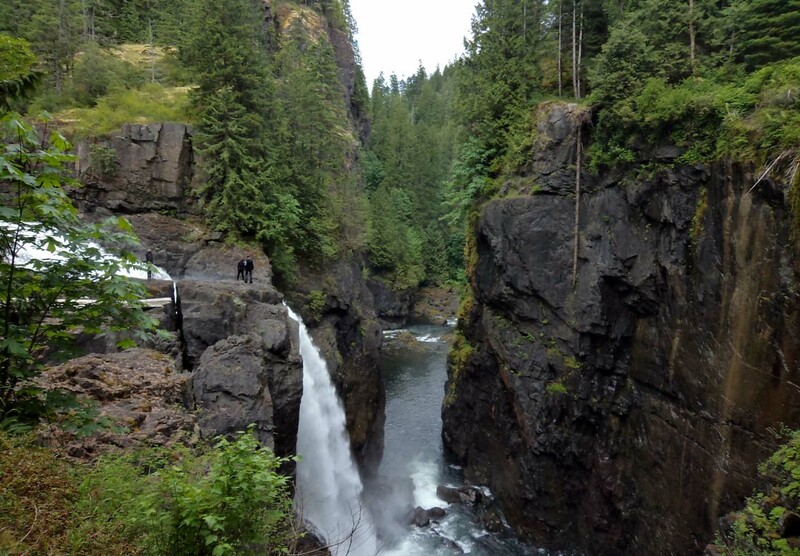 If camping isn’t your thing (or you have a rental car), you can still get a taste of the wilderness of Northern Vancouver Island by visiting Elk Falls, Strathcona Park, Telegraph Cove and Alert Bay). From Campbell River, head west along Highway 28 towards Strathcona Provincial Park. Stop at Elk Falls just outside of town for a short hike ending in a suspension bridge and dramatic views of the 25m waterfall. 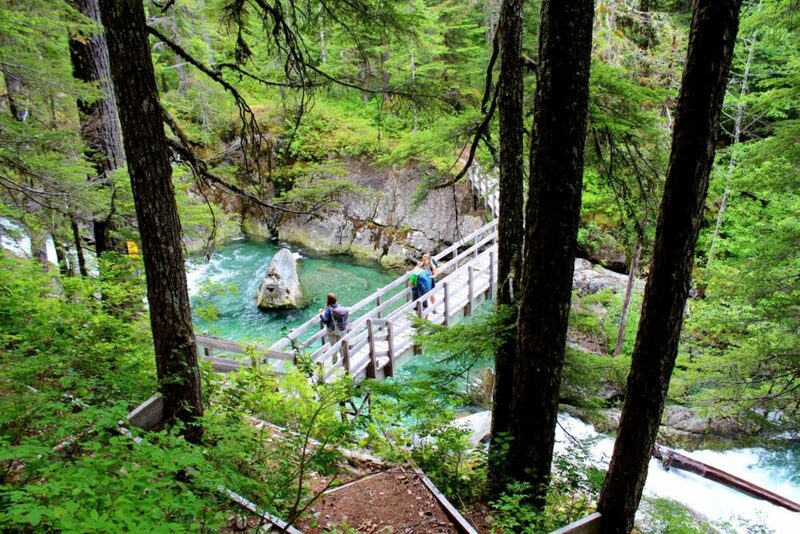 There are more chances for hiking once you pass into Strathcona, British Columbia’s oldest Provincial Park. There are also two campgrounds along the shores of the deep and brooding Buttle Lake. Stay overnight here or continue towards Gold River. Turn off Highway 28 at Gold River, and follow the gravel Gold River and Head Bay roads to Upana Caves. Vancouver Island is a hotspot for caving, with more explored limestone caves here than the rest of Canada combined. There are fifteen entrances to Upana’s cave system, with caves ranging from tiny passageways to large openings. Be sure to take a couple of light sources and enjoy exploring. After the caves, head back to the Gold River Road and head north, later crossing onto Nimpkish Main South logging road. Muchalat Lake, around 20 minutes in, is a good option for an overnight stay. Nimpkish Main South continues to Vernon Lake and then heads right to Klaklakama Lake Rec Sites. Woss Lake to the west offers more yet free camping, fishing, hiking and paddling opportunities. 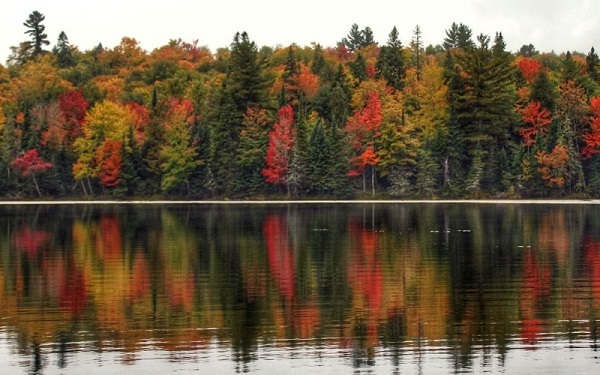 From Klaklakama or Woss Lakes, you are just a few kilometres from paved Highway 19. In between here and Port McNeill there are more caves in Little Huson Regional Park, just south of the very windy Nimpkish Lake. There are further options for free camping here too at the surrounding lakes. Port McNeill is the jumping off point for trips to the islands of Sointula and Cormorant. 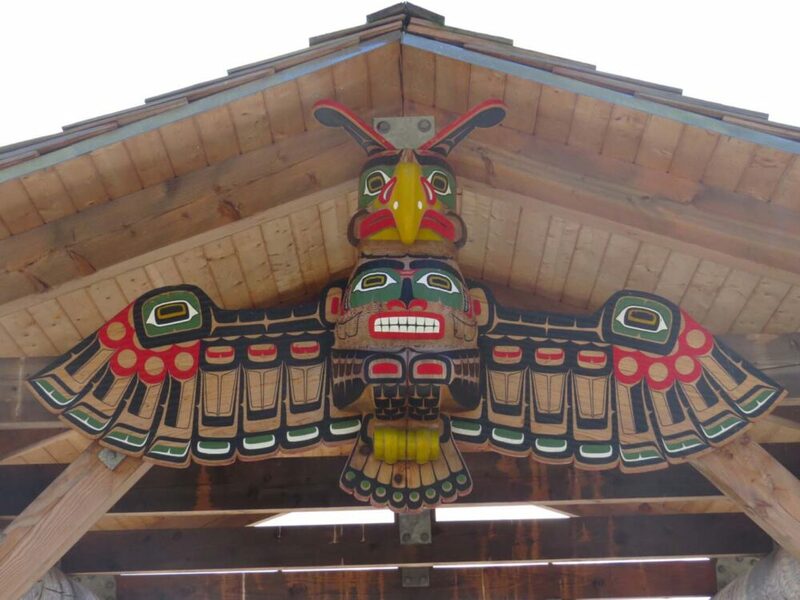 Alert Bay, on the latter, has a lot to offer, with rich First Nation culture and plenty of wildlife opportunities. A short drive from Port McNeill is Telegraph Cove, an attractive former fishing and cannery village. It is worth a stop for a walk on the boardwalk and a visit to the whale museum, but be prepared for busy parking lots in the summer. Now to the end of Vancouver Island. Just before Port Hardy, turn off and follow the signs for Cape Scott Provincial Park. A good few hours of driving on fairly decent gravel roads driving is ahead of you, but it’ll be worth it. 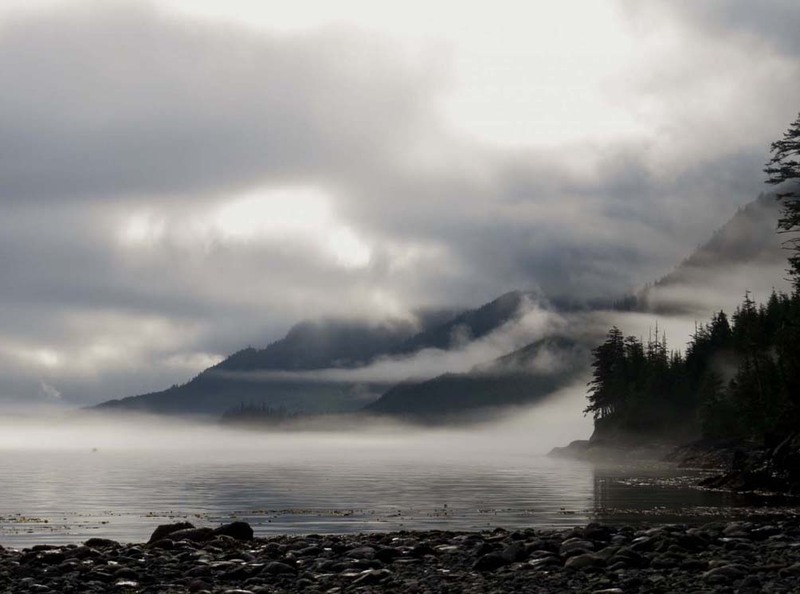 Visit San Josef Bay (Cape Scott Provincial Park), Raft Cove Provincial Park or Cape Palmerston for a coastal experience like no other on Vancouver Island. 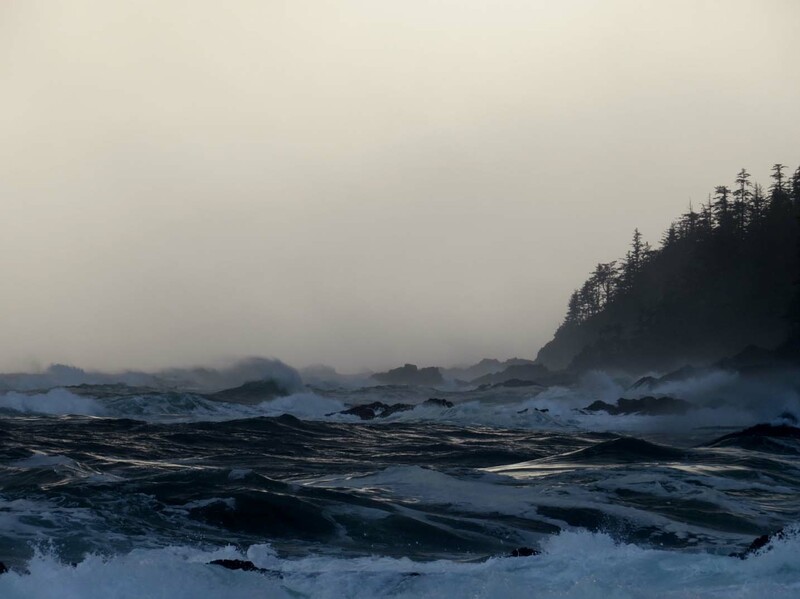 This area offers a wilder and more authentic version of Tofino; rugged coastline, jagged rocks, beautiful beaches and incredible Pacific Ocean views. Best of all, you’ll probably only share it with a handful of people, if any at all. If you’re up for a challenge, consider a multi-day hike to Cape Scott’s lighthouse (around 45km return). If you’ve still got time and a sense for adventure, consider a side trip to the Port Alice area before returning to Port McNeill. Not only are there plenty more lakes to fish and paddle, there are a number of geological oddities in the area, such as the Eternal Fountain, Devil’s Bath and Vanishing River. The gravel roads are a bit rougher down here but are fairly quiet. Heading east on Highway 19, you’ll be on a straight run all the way back to Campbell River. Enjoy the mountain views and stop at the many rest areas to soak up the scenery. If you have time, stay overnight at Pye or Stella Lake, about an hour north of Campbell River. These lakes are accessible via the reasonably well maintained Rock Bay FSR and provide a number of excellent Recreation Sites with free camping. On the way back to Campbell River, make a quick stop at the Ripple Rock lookout (marked on Google Map at top of itinerary). Ripple Rock is an underwater mountain in the narrows between Vancouver Island and Quadra Island. It was a marine hazard until 1958, when it was partially destroyed in one of the largest non-nuclear planned explosions ever. After that knowledge ‘bomb,’ you’ll be back in Campbell River in no time! Here are some additional ideas to extend and enhance your road trip on Vancouver Island. Salt Spring Island – Laid back and artistic with a side of hippy, Salt Spring is the third largest of the Gulf Islands between Vancouver Island and the BC mainland. Be sure to check out Ruckle Provincial Park and the Salt Spring Island Cheese Company shop. 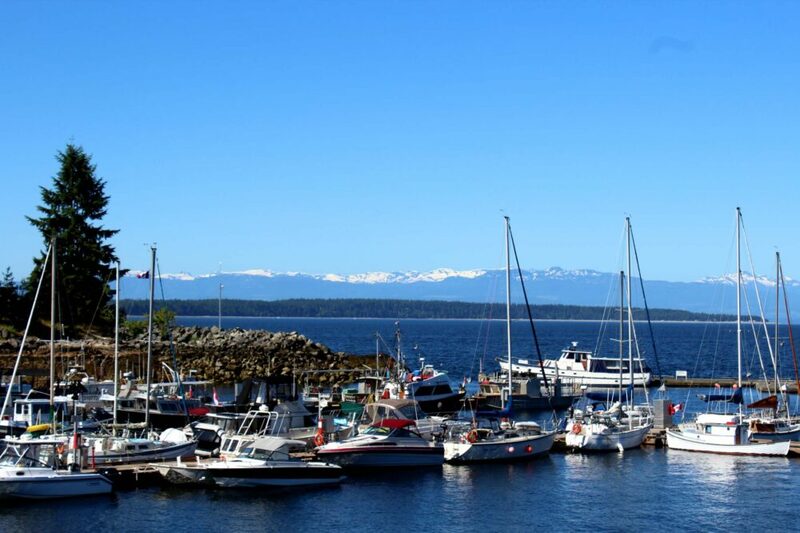 Denman and Hornby Islands – Located just south of the Comox Valley, relaxed Denman Island is accessible via a short cable ferry ride. 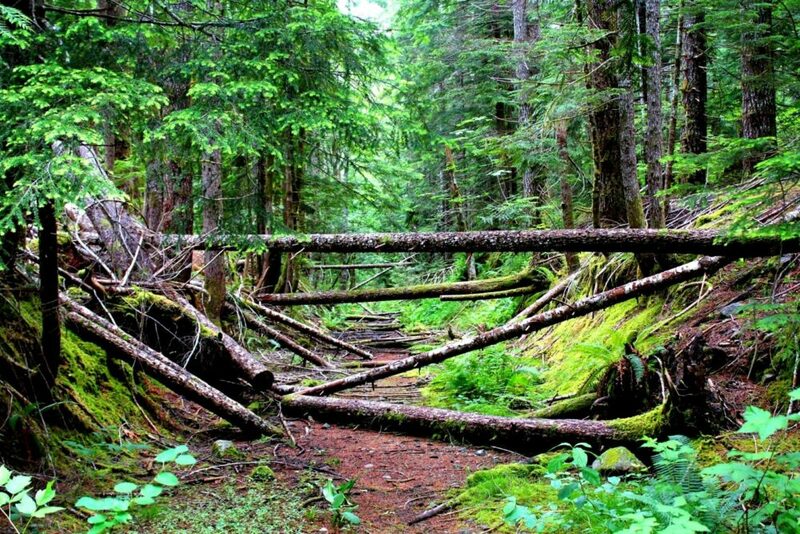 Marvel at the magnificent old growth trees in Fillongley Provincial Park. Hornby Island is just another ten minute ferry ride away. On Hornby, a trip to the beautiful white sand shores of Tribune Bay is a must. 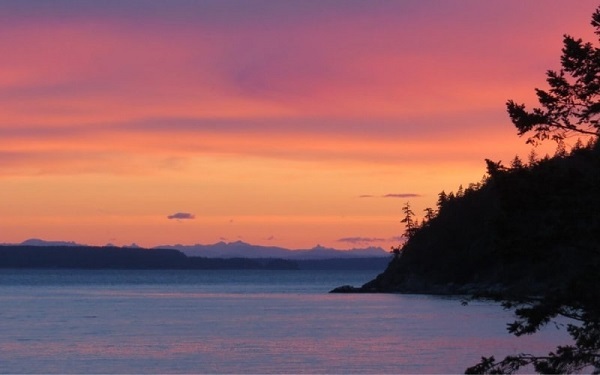 Quadra and Cortes Islands – Easily accessible from Campbell River, these islands offer fantastic coastal views and a slower pace of life. Visit the Cape Mudge lighthouse on Quadra and canoe on the Main Lakes network. On Cortes, take a refreshing swim at Hague Lake. 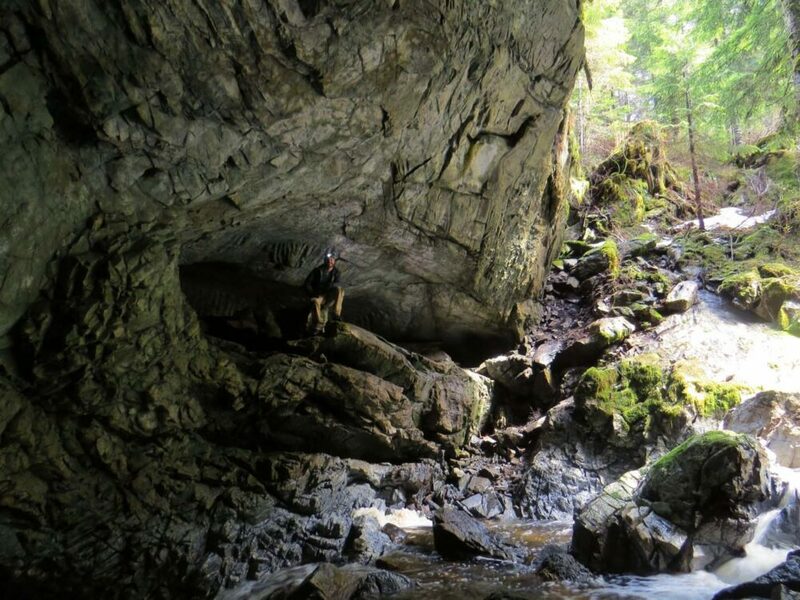 Explore a cave – Vancouver Island has the highest concentration of caves in North America. Aside from those already mentioned at Upana and Little Huson, you can also explore cave systems at Horne Lake (near Nanaimo). Short, accessible tours are available as well as adventurous caving trips. Victoria – Staying in Victoria for a while? Some other fun things to do include wine touring, a trip to Butchart Gardens, zipling, a harbour kayak tour or a guided hike. The Inside Passage – For the ultimate departure from the Island, consider travelling up the Inside Passage via Port Hardy. 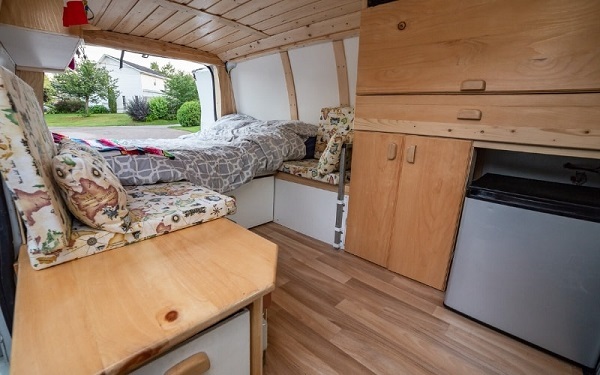 It’s expensive, but a great alternative to driving to Prince Rupert and Haida Gwaii! Like this post? PIN or save it with one of the below images!